Invisalign – the clearer alternative to braces? Invisalign treatment is now available at Marsfield Dental Care! Now a more aesthetic alternative traditional brackets and braces is just a consultation away! However, is this popular option the correct one for you? Invisalign treatment consists of the patient wearing a series of clear plastic aligners that slowly shift teeth into their ideal positions. Each aligner must be worn at least 22 hours a day to achieve effectiveness! This is different to standard treatment with braces, which does not allow removal of the active appliances. Only a dentist can intentionally remove the brackets and wires. As a result, many Invisalign patients find their mouths easier to clean compared to patients with braces on, as cleaning is as simple as taking the aligner off and brushing and flossing as per the norm. Surprisingly, many patients find Invisalign just as (un)comfortable as normal braces. 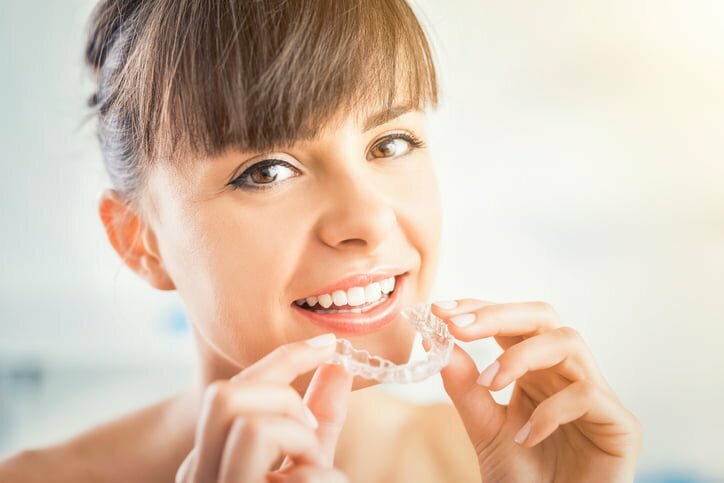 While there are no wires or brackets that can potentially rub against your cheeks with Invisalign treatment, most patients take some time getting used to the clear plastic aligners which are adapted to your teeth for at least 22 hours a day. Aligner technology is actually decades old. Many dentists have been using clear aligners for years to produce minor tooth movements at the end of braces. It has only been within the past 10 years where this technology has really boomed! Generally when it comes to teeth that are significantly “crooked”, Invisalign is not as effective as traditional treatment with braces. In addition, Invisalign treatment usually takes longer than treatment with braces. Nevertheless, Invisalign is a valid alternative to braces for minor to moderate cases, especially when aesthetics is an issue. Each case is different. It is impossible to set a price without proper examination and all the pre-treatment tests that apply to standard braces treatment too. However, in general, Invisalign treatment is slightly more expensive than braces treatment. This is because the impressions we take are sent overseas for analysis. The aligners themselves are also manufactured overseas! So is Invisalign for me? If you want straight teeth, but want a more natural-looking alternative to braces, Invisalign may be the option for you. For more information, feel free to arrange an appointment with one of our Marsfield dentists.